Shortly after relocating our shop in 2001 I began to consider some new furniture design ideas. I was particularly intrigued with the idea of making a custom bed that could be an amalgamation all of the holistic and ecological principles I was experimenting with at the time. This ultimately manifested in the design of the Irenic Bed. The word irenic is Greek and means: “fitted or designed to promote peace; pacific; conciliatory; peaceful.” This seemed highly appropriate considering my underlying intent to weave together many divergent elements into a holistically balanced and restful whole. For most of us the bedroom is the most important room in the home, with the bed being the focal point of this sacred space. Our bed is the place we turn to for comfort and refuge, and it is also here that we can find the time to think and reflect. 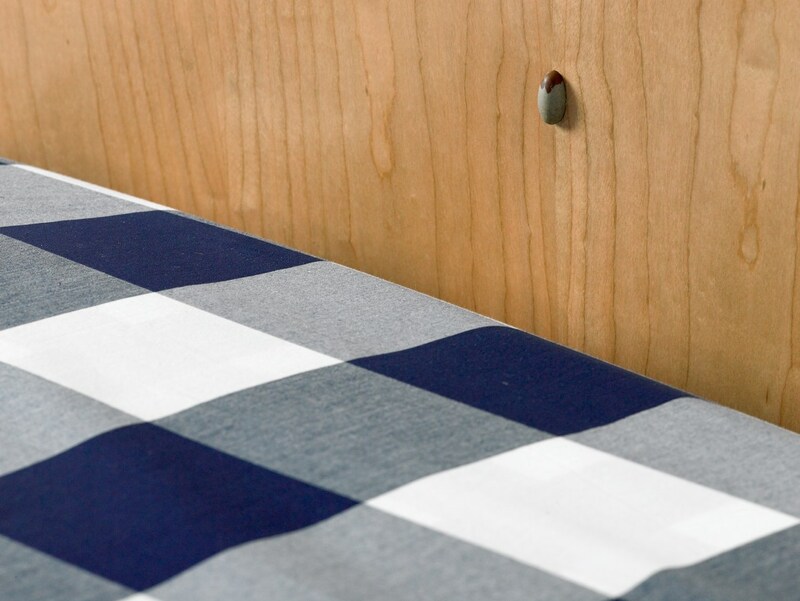 Our bed is the place we can be vulnerable and share intimate moments with those we love. Our bed also offers protection, and is the place we go to when we need to heal. 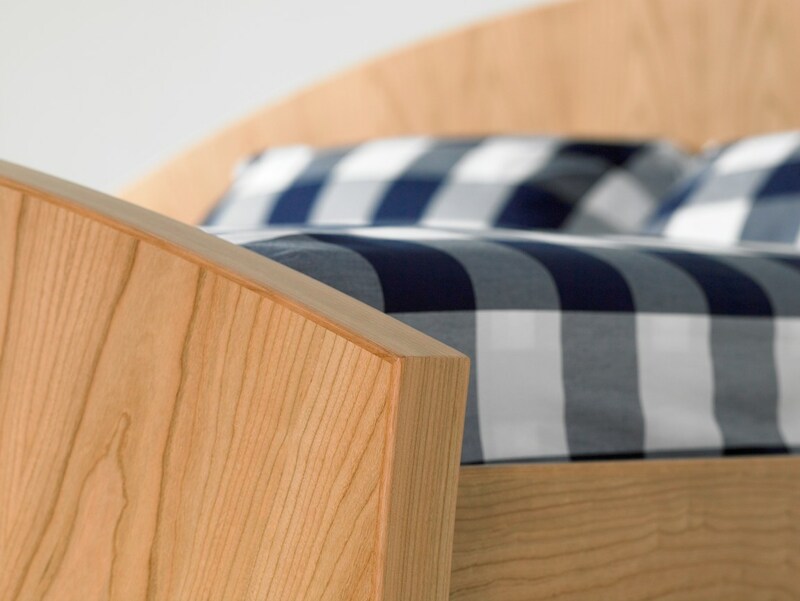 Because we spend about 1/3 of our lives in bed (based on the assumption of 8 hours sleep per night) it can be argued that a bed is the most important piece of furniture in the home. An initial prototype was made in 2002 out of a dark wood called Wenge, and upon completion it was sent to Chicago for display at the Lee Weitzman showroom. Although much positive feedback resulted in the ensuing months, it languished in the showroom for a while before finally being sold. For the next few years I toyed with the idea of making a second version of the bed, but refrained from doing so largely because it was a difficult piece to display due of the large area of floor space it covers. And, so, the idea stalled - but I never gave up on it entirely. 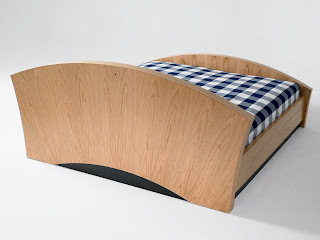 Then one day in 2005 I was discussing sustainable furniture ideas with an eco-designer by the name of Jill Salisbury, and she began telling me about this amazing bed she had seen in Chicago a few years earlier. It didn't take long to figure out it was the Irenic Bed she was talking about, even though at the time she had no idea who made the piece. I was fascinated by how much the finest details of the design ended up resonating so powerfully with her. Inspired by that discussion I decided to make another version of the bed. The second incarnation of the bed was done in natural flat cut Cherry. Slight angles were added to create a radiating sunburst effect on the head and footboards, which was meant to emulate the image of a setting and rising Sun. Beaded corner details were also set into the edges to give a gentle softening effect to the design. The head and footboards were each constructed as heavy monolithic slabs, with the bed sides being suspended between each by way of mortised steel bed hooks that were discretely inlaid at the intersections. As an added convenience: no tools are required for assembly, and once it's together it is absolutely rigid and thoroughly grounded in place. All wood used in the making of the Irenic Bed is FSC certified for using wood that has been sustainably harvested from well managed sources. This is verified by independent third party audit under Smartwood certificate #SW-COC-000055. In addition to being FSC certified the plywood core material is also NAUF (no added urea formaldehyde) which, in turn, makes it CARB2 (California Air Resources Board) compliant. The glue used in our own lamination process is a Titebond product that is non-UF (non-urea formaldehyde), while the water based finish is a low-VOC (low-volatile organic compound) water based urethane from AFM that is so ecologically sound that it is doctor recommended even for those with chemical sensitivities. 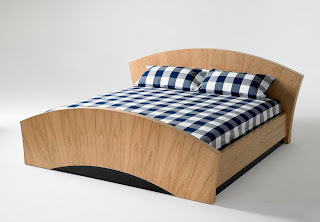 The Irenic Bed is also consistent with the sustainability standards set out by the U.S. Green Building Council’s stringent LEED (Leadership in Energy and Environmental Design) program, namely the MR-7 Credit for certified wood use; the EQ Credit 4.1 for Low Emitting Solvents and Materials; and the EQ Credit 4.2 for Low Emitting Materials, Paints and Coatings. 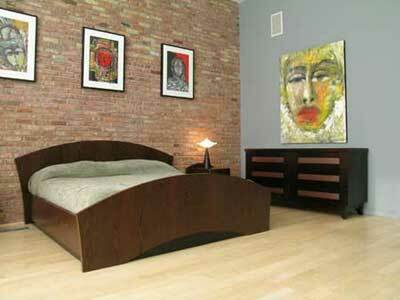 The bed as shown in these photographs was displayed with Hastens boxspring, mattress and bedding. Many consider Hastens to make the finest beds on the planet, with the bonus being that their focus on green and ecologically sound principles is consistent with our own. As a finishing touch the back of the headboard is also fully finished. Inlaid into the back of the headboard (just below the top) is a small convex detail of wood that carries a special provenance in the world of sustainable forest management. This wood is known as Narra and it comes from the last remaining board known to exist of the very first wood to be sustainably harvest on the Solomon islands in the early to mid 1990s. This wood made its way into North America by way of Eco-Timber in California. Inlaid into the face of the headboard (and located discretely behind the pillows) is a small ovoid shaped stone known as a Narmadeshvara Shiva Lingam. This is a Hindu sacred stone that has been ceremoniously gathered once a year from the muddy banks of the Narmada River, one of the 7 sacred holy places of pilgrimage in India. It is an Indian belief that millions of years ago a meteorite collided with the earth at what is now the source of the Narmada River in Madhya Pradesh, a mountainous province some 300 miles northeast of Bombay, India. The tremendous heat of the collision caused a fusion of the ambient rock and the meteoric material. Over the ages a river began to flow through this area and the combination of these factors produced the unique condition in which pieces of the fused matter, revolving in the river bed over thousands of years, take on a distinct ovoid form. The oval form is markedly different from the flatter, thinner rocks normally appearing in the riverbed. Once a year, after the long dry season and just before the monsoon, when the river is at its lowest, the villagers, working with oxen and rope, go out into the riverbed and pull the stones from the water. The stones are then hand-polished, a large one taking several months to complete. About twenty to thirty large pieces are taken from the river each year. Down through the ages these stones have been carefully selected from this energy centre during the dry season by a few families, trained in the art of collecting, shaping and polishing the stones to bring out the natural markings called the "yoni". The lingams are handled in accordance with ancient Vedic tradition, and are thus highly blessed. They have been allowed to come out of India at this time because of the desperate state of the planet. The Lingams are energy generators of balance, of Soul consciousness, and healing. It is believed they are impregnated with spiritual light resonating with the fifth Chakra, or Heart Chakra; thus their particular job in healing the planet is through opening the heart, healing the pain in the heart that obscures the harmony and knowingness of the soul residing within. It is said according to the Vedic knowledge that the Lingam represents the inner being, the energy shape of the soul, or the essence of a human being. The upright egg shape represents the divine masculine energy, the power of Shiva. The marking, called the yoni, represent the divine female energy. Here is a balance of male/female, Yin/Yang, dark/light, knowledge/wisdom, the positive/negative energies unified - the wholeness of the soul, which is neither male nor female. It is also said that by destiny everyone has their own Lingam. It is as if the signature of one's soul has been alchemically embedded in the stone down from the millenia of its making in the embrace of Mother Earth, and finally in the hands of an esoteric craftsperson. The Lingam draws out our soul qualities. As a result, it is a potent force for healing and meditation. Typically the Irenic Bed is available in either King or Queen size, but it can be easily customized to accomodate various thicknesses and styles of boxsprings and/or mattresses. In addition we are always more than pleased to custom tailor our design to suit the needs of each individual client. The photo below shows a recently made custom version of this design which was made from a combination of stainless steel and a rare sampling of wood known as East Indian Laurel. For this project the clients were also interested in having a matching dresser, chest of drawers and pair of night stands made to complement the Irenic Bed design. This invariably led to the creation of the Diego series of bedroom casegoods - which will be featured in the next post. Labels: AFM, cabinet maker, custom made furniture, FSC, Hastens, LEED, low-VOC, NAUF, non-UF, Sustainable, Wiggers Custom Furniture Ltd.